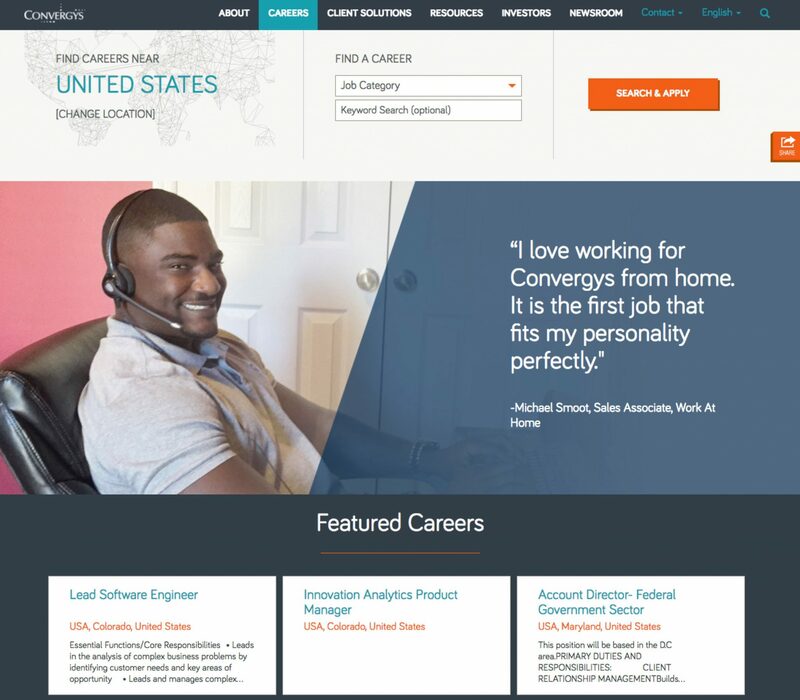 If you have work from home jobs, you are leaving money on the table by not showcasing them off your company career page. We recommend you do a set of microsite landing pages for your work from home jobs (more on that at the bottom of this article), regardless of how few you have. 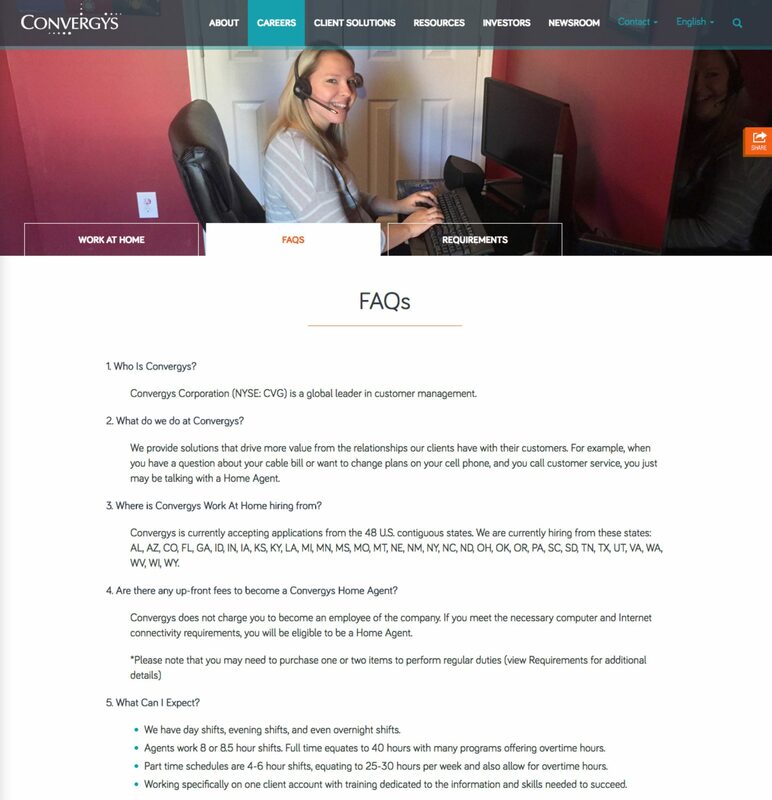 Convergys puts a little extra effort into their work from home microsite, including Frequently Asked Questions (FAQs) as well as requirements. Xerox emphasizes their VIrtual Office Program in which 8,000 employees work from home. They add a nice touch called “Heroes@Home” for recruiting military veterans and their spouses who get to work from home. 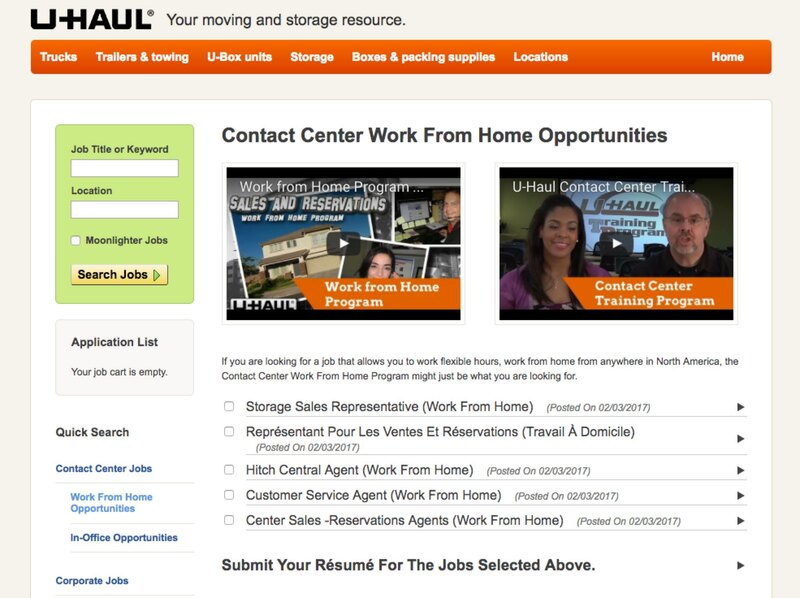 U-Haul has a set of Featured Jobs to recruit work from home candidates to support their Contact Center (Call Center). 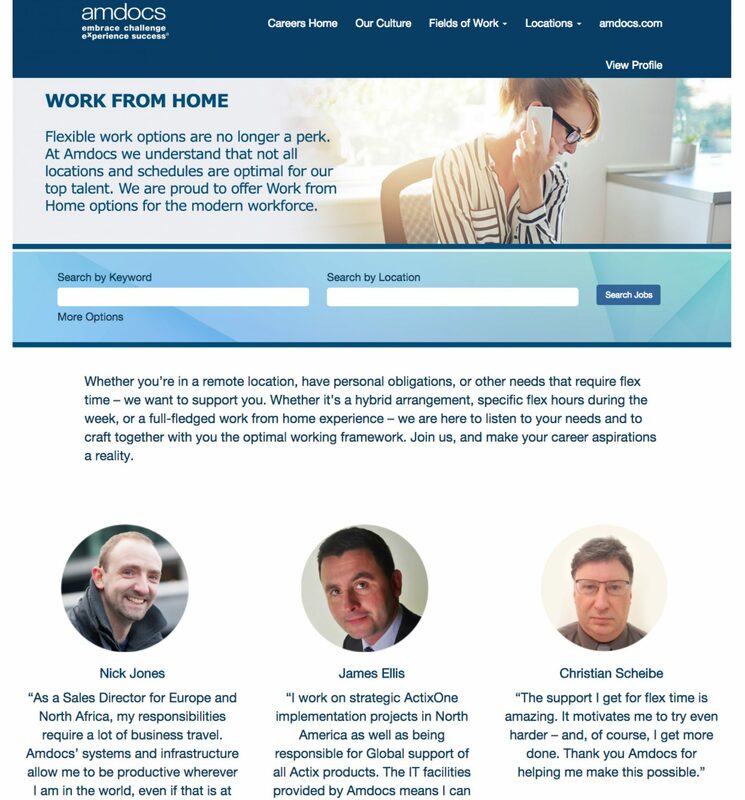 Amdocs has employee testimonials from those who work from home. 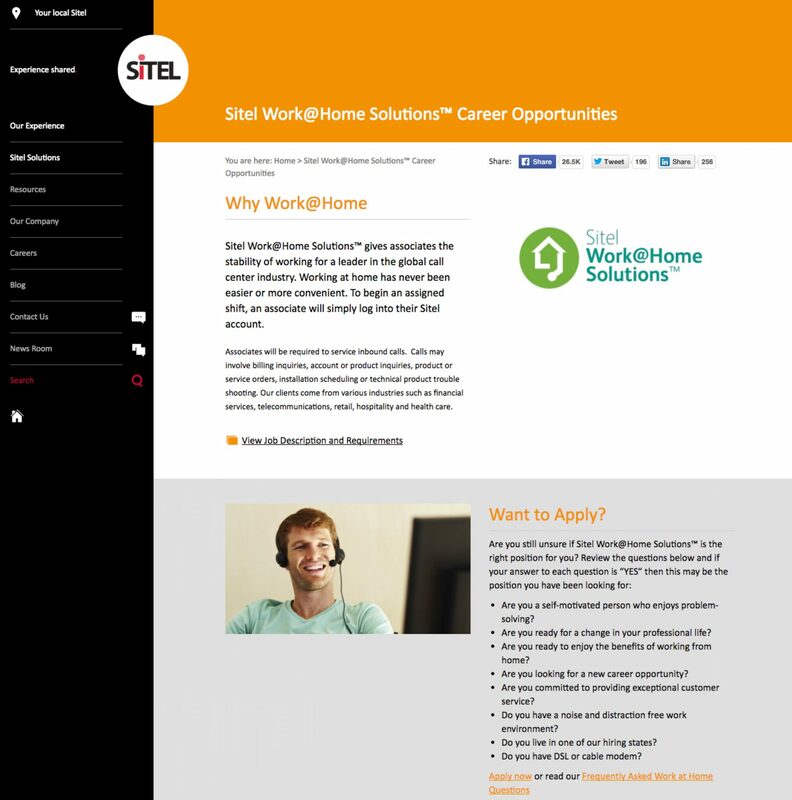 SiTEL spells out (in their Want to Apply? section the key criteria they are looking for in their work-from-home candidates. Most major applicant tracking systems let you tag a job as work from home either through the location or through a search filter. That way, when you need to build a microsite for work from home/virtual jobs you can do a fetch of just those work-from-home jobs. First Ongig, dynamically generates microsite pages for your work-from-home jobs so you don’t have to build one yourself. Secondly, Ongig dynamically generates more work-from-home pages by location (e.g. “Work From Home Jobs in Sales”, “Work From Home Jobs in Technology”, etc.). That way you have multiple microsite landing pages attracting work-from-home talent (important for Google and SEO). Thirdly, Ongig puts a Talent Community capture form on every microsite landing page to capture those who don’t immediately find a job — so you can target them later!